One of the common pitfalls of leaders I described in my last blog post is the Responsibility Virus. In today's post I will share a great tool with you that should help you not only lighten up your own workload (whoa, that would have been enough, right?!) but actually help you develop your employees and create some real ‘bench strength’ on your team. Are you ready? Strap yourself in. First, a quick recap of The Responsibility Virus: it causes leaders to think they are being ‘heroic’ by removing responsibility from their passive followers. They get into a vicious cycle where the more they take on (or take back on) themselves, the more the passive followers retreat and reduce their commitment to pushing through hardships. The over-responsible leader becomes more hesitant to trust the followers, who become aware of this lack of trust and retreat even more. And the over-responsible leader becomes burned out. Well, one of the main contributing factors to this ‘virus’ is the absence of productive strategy and execution around delegating decision-making responsibility on the part of the leader. And one of the best ways to begin resolving this problem involves taking a good look at the way you assign responsibility and the level of decision-making involvement you demand of (or allow) your followers. You need to figure out a new way of delegating responsibility based on capabilities. Not only will that help your staff make better decisions and take greater responsibility in doing so, it will also build internal commitment as well as enhance a sense of collaboration and mutual support. 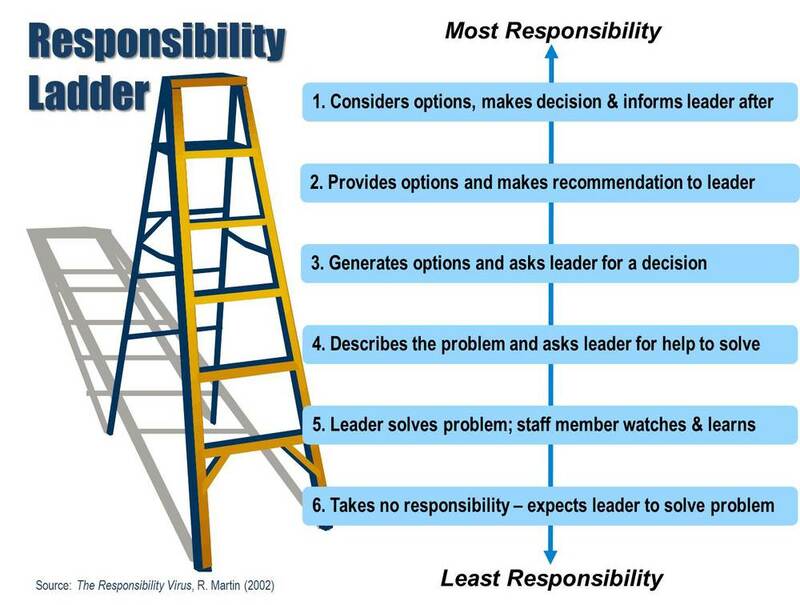 So How Does the Responsibility Ladder Work, Exactly? When employees are new to the job or to a task or process, they will naturally defer to their leader for making necessary decisions. They don’t have enough background and knowledge to equip them for good decision-making. This is normal and good! Yet as they gain experience with the work, process or task at hand, employees also gain confidence and knowledge that should enable them to become increasingly involved in the thought process behind the decision-making. And your job, as their leader, is to move them up along the rungs of the responsibility ladder and growing their decision-making capacity and capabilities. So, if a new employee is ready to move from rung 6 to 5 on the ladder, this transition entails becoming an observer of their leader’s decision-making process so they can learn the thinking behind it. With greater experience comes greater capacity, and therefore greater responsibility, for taking an increasingly more active role in the decision-making process. Soon, they will be able to move into rung 4, where they can describe the problem and get help from the leader in resolving it. Then, after some practice at that level, they should be ready to be expected to come in to a conversation with their leader equipped with several options to lay out for their leader to choose from (rung 3). Eventually, they will be able to not only present options but also recommend the best one to the leader (rung 2), until they are able to independently decide and simply keep the leader informed of their decision (rung 1). What’s the Right Place on the Responsibility Ladder for My Employees? Here’s the thing: there is no one ‘right’ place on the ladder. It is totally contextual and depends on each person’s level of comfort and capability with the work about which the decision is being made. A brand new employee might have zero familiarity with this particular organization’s processes but may have had many previous experiences with a particular kind of thought-process or workflow elsewhere to put her quite high on the responsibility ladder for a particular task or process. Conversely, a very seasoned and responsible employee may drop down several rungs on the ladder when assigned to a brand new task or system about which they don’t have much knowledge or background. What we know is that if your employee gets stuck on one rung for a long time, this is a sign you need to make a change. Could it be that your Responsibility Virus is operating in the background and causing you to hold that person back from growing their decision-making capacity? Or are they too unsure and insecure to take on additional responsibility and need some additional support and encouragement from you? Even if they operate at the top rung, you should actually worry about those employees that are stuck up there for a long time: are they ready for a promotion and you’re holding them back? Or are they not receiving (or taking) opportunities to stretch outside their comfort zone and learn new skills? It’s a dynamic process and you need to keep a watchful eye on each employee’s ladder with your finger on your own pulse as well as theirs. Are you ready to free up some of your workload while also growing your employees’ capacity and capabilities? Here’s your chance to do some thinking about your followers. Take a few minutes, sit down somewhere quiet and answer these questions honestly for yourself. Where are your employees on the Responsibility Ladder? Where are you (as you relate to your own boss)? What steps can you take to help people move up the ladder? What responsibility conversations should you be scheduling with your employees? When will they take place? What’s your next action? 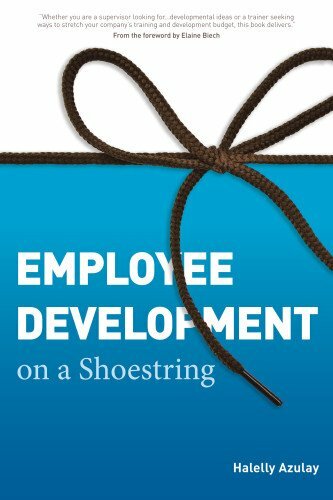 I hope that this has given your some rich food for thought and insights about your own growth and the opportunities to develop your team. I’d love to hear some of your reactions and ideas in the comments below – let’s make this a learning discussion and keep the conversation growing!